The pièce de résistance of the Gravensteen Jail was the whipping pole installed on a small square in the middle of the building. The pole was surrounded by windows from three sides, allowing visitors or other criminals to properly see what was going on. The jail began as a fortified safety house for the city’s counts and was built in the beginning of the 12th century. It later served as the counts’ private jail. In 1463, Duke Philip the Good donated the building to the city, and it became a public jail. Sadly, in those days, those who were interred here usually faced torture, long imprisonments, mutilation, and executions. It’s chilling to see the effort that went into designing this pole and the little square surrounding it. You enter the square by passing through a heavy wooden door with massive metal braces and locks. The windows have thick metal bars behind them, and the wall goes up about 16 feet (five meters), making it nearly impossible to escape from the square. The pole itself is made of stone with metal handles on the front and top, allowing the accused to be securely fastened to it. It’s placed in a small depression with little gutters leading away from it on both sides. These gutters were used to drain the victims’ blood. 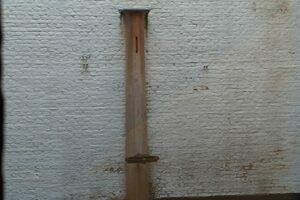 The pole was used well into the 19th century. The last execution took place in 1856, and it’s believed the last physical punishments stopped around that time as well. The jail remained in use until 1955, after which it closed down and later reopened as part of the law faculty of Leiden University. This pole is one of the few remaining whipping poles in the country, and the only one still in its original location. Currently, it is used as an ashtray, perhaps a dark joke to remind smokers of the torture that they are exposing themselves to.